Above - The Auditorium of the The Palace Theatre, Mansfield in 1984 before its 1997 redevelopment - Courtesy Ted Bottle. 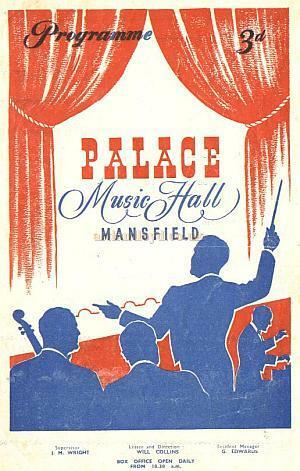 The Palace Theatre in Leeming Street, Mansfield was originally built as a Cinema with a small stage called the Palace Electric Theatre. The Theatre was built by F. P. Cook & Lane and opened on Tuesday the 13th of December 1910. 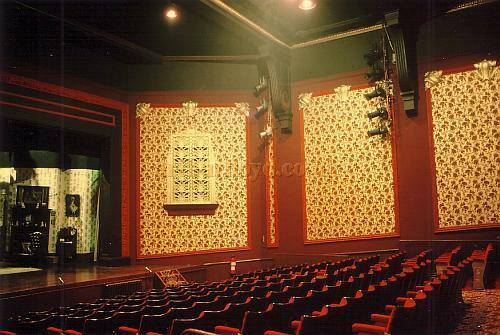 The Theatre's stage was enlarged in 1949 when it was converted for live Variety performances. In 1956 the Theatre was renamed the Civic Theatre, and had a capacity of 582. 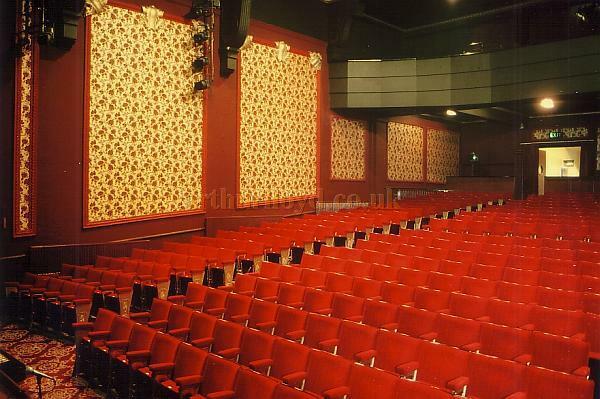 The Theatre was redeveloped in 1997 with funding of well over one and a half million pounds from the National Lottery and Mansfield District Council, and now has a new stage house with flying facilities, improved FOH facilities, and an auditorium with a larger capacity of 750. Right - The Auditorium of the The Palace Theatre, Mansfield in 1984 before its 1997 redevelopment - Courtesy Ted Bottle. There is a 360 degree image of the auditorium from the BBC here. You may like to visit the Palace Theatre's own Website here. The Palace Electric Theatre opened in 1910 as the Electric Palace presenting Cine-Variety. In 1950 there were signs of a partial refurbishment of the Palace which would have seated around 600 in stalls and balcony, there were just plain side walls, a very small stage and the follow spotlights were, unusually, operated from a projection room at the rear of the Stalls. You will see on the Programme (shown on this page) that the Direction was in the hands of Will Collins, this would have been the well known agent Joe Collins who often used his Father's name in business matters. Joe was the father of Joan & Jackie Collins. Will Collins was also a well known agent, who died at the young age of 39 on 17th June 1915, the result of a blood clot in his leg which was the result of an incident at the Shepherd's Bush Empire a few weeks earlier. Will was watching an act of his, a girl being spun around the stage in her partners arms when a belt came off her dress, she stooped to pick it up whilst the act's music was still playing, Will considered this unprofessional and came backstage and had "words" with her about it, her partner who was also her husband, named Larry Sebellas, objected to Will's behavior, there were fisty-cuffs during which Will was kicked badly on the shins. Refurbished and with a new stage-house, The Palace now serves as a Civic Theatre. It always amazes me how these smaller theatre, often known in the Variety fraternity as "Daisy Dates" still operate as live theatres when the bigger and grander theatres bit the dust half a century ago. 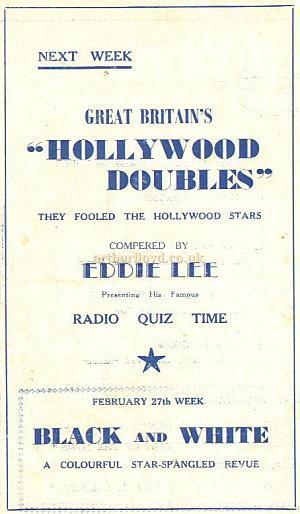 Left - Extract from a Variety Programme for the Palace Theatre Mansfield in February 1950 - Courtesy Alan Chudley. 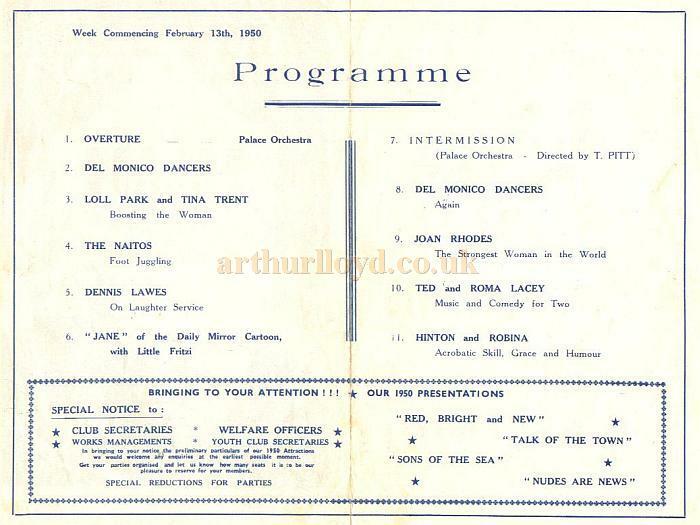 Above - Extract from a Variety Programme for the Palace Theatre Mansfield in February 1950 - Courtesy Alan Chudley.